Our survey showed that the Park is a great resource, is much used and valued and has great potential for local people. Big space for running around. Pleasant green space for visiting, walking, strolling, watching football, sitting in. Families with children enjoy it playing football amongst family members etc. Very nice for picnics- many families do use it for this. 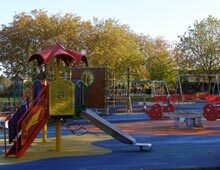 Separate play area for children and families- Playground area has potential to be a great place for children. Even as it stands many parents and children use it and value having it. Used a lot by football groups. Can be great place for football though no changing rooms usually open for use. Separate basketball and tennis areas facilities. Friendly Bowling Club with very well maintained greens. Enjoyed by considerate dog owners. Some nice flowerbeds, well maintained in play area. People remember fondly a ‘Community Day’ some time ago. Pleasant walk on way to tube away from all the traffic and junctions of the alternative road route. Recently new lighting from Ashley Road to Park View road has improved safety and sense of safety. Also a barrier to stop children running onto the road has been recently installed which greatly improving safety re young children running onto road from playground. New attractive signage has also been installed last year. Park is a great resource and has great potential for local people. Facilities for the 13-18 age groups. Facilities and opportunities for young people (13-18) such sports & training. Improvement /renovation/relocation of of tennis, basketball facilities etc. Ark keepers /community & development workers to create a safe clean environment for all park users and working to promote greater use such as sports leagues such as basketball, football, tennis and cricket. More flower beds in park Can facilities be made available and use promoted after dusk. All improvements must lead to greater safety and health of children using the park. All improvements must lead to greater security for commuters in park and along Park View Road and Ashley Road. Display boards to be located at gates at Park View Road. At the moment the main display board is at exit to Ashley Road. Most people using park other than for commuting enter from Park View Road. At the moment entrance to the marshes is obscured and has many problems, flooding, threatening, smell, ugly. We are hoping for much improved signage and promotional material in Down Lane Park re the marshes and substantial improvements to the entry to the marshes at the bottom of Park View Road. We are in touch with Friends of the Marshes who are very supportive.